Join us for Nov 17th and 18th, 2018 starting at 8am till 5pm on Sat and 8am to 3pm on Sunday. Flyer and discount coupon Here. There will be Live Demonstrations at the show on the Outdoor Range Complex to showcase some of their Mass Compliant firearms. Steel targets will be available to shoot at during the event with paid attendance to the show. Al Spinosa and his crew could use your help this winter. The parking lots need to be cleared, ranges cleaned up and paths made. Snow blower work and hand shoveling crews are needed also. Please contact Al via email here, to let him know you are able to help out. Every little bit of help gets the job done. Utah State Concealed Carry Course. Club Member Joe Morgan is a Firearms Instructor and teaches at Outer Limits Pro Shop in Holbrook. The Utah State Conceal Carry permit allows concealed carry in 32 states due to reciprocity agreements with other states. The course is normally $100. 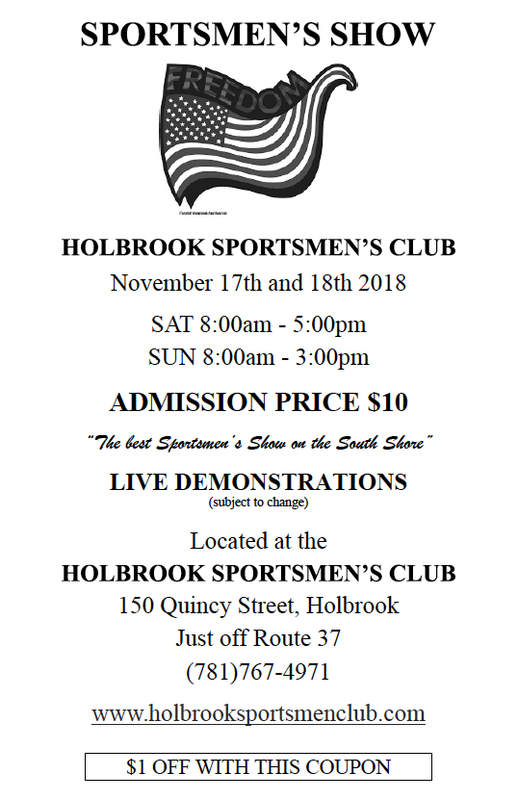 Joe has offered the course with the E-Boards approval to Holbrook Sportsmen's Club members at a discounted rate of $50. Use Promo Code HSC UTAH when registering for the course. Joe's website can be found here. Frank Duggan, the owner of Outer Limits Pro Shop where the classes are hosted, has authorized a coupons for any HSC Members who take the class. The coupon is for $20 off a firearm purchase. In House Summer Rifle League .